Welcome to the Edwards County KSGenWeb pages. My name is Don Benish (don.benish@gmail.com) and I'm your county coordinator for Edwards County. If you have anything that pertains to Edwards County, (i.e., census records, tombstone transcriptions, cemetery records, marriage records, obituaries, etc) that may be of assistance to others, any books or other reference materiel pertaining to Edwards County, or would like to be a Lookup Volunteer? Please email me. If you are just starting out in search of your ancestors, I've provided some links below that may help you. Edwards County Lookup Volunteers List Volunteers to provide 'Lookups' in the materiel they possess or have access to. 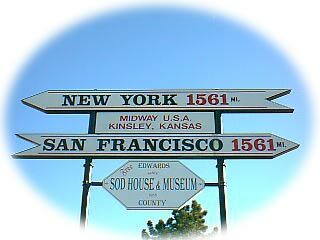 Orphan Counties: If you would like to host one of the "orphan" counties for The KSGenWeb Project, contact the Kansas 'Orphan' County Coordinator. Information about the responsibilities of a county host can be found by clicking here. Page Design, HTML Coding and Layout - Copyright�1998-2004 by Don Benish, 2004 by Don Benish, All Rights Reserved.